Twitter is still good for something. I consider Twitter a dying platform. In my estimation about 70–80% of engagement on Twitter is bot behaviour. Likes, retweets, adding to lists, follows — it’s all fake. I know this because I auto-follow/unfollow myself. 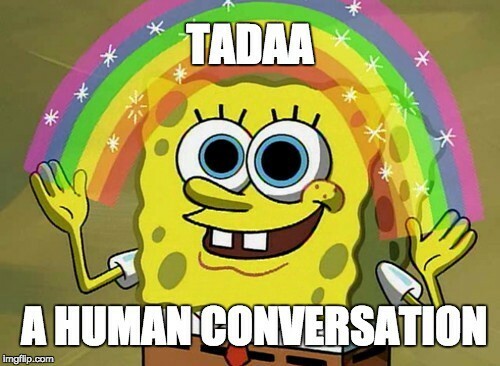 Because there’s still one great way to drive human engagement on Twitter. 👉 Whenever I get a new follower through auto-following, I sent them an auto-message asking them a triggering question. This works quite well. Who doesn’t like pizza, right? About 60% now starts explaining how they like their pizza. For most people it’s a relief after being hit in the face with a eBook shitstorm all day. When you chat with people, make it about them. Not about you. As soon as they answer, you take over. Talk a bit about pizza and show genuine interest in what they’re doing. If they’re human being material, they’ll ask you the same and you’ll have yourself a real conversation. Automate to scale reach 🤖, be human to build relations 🤝. Just talk. Show genuine interest, listen and help out. Build your know, like and trust factor. This isn’t something I’ve been investing a lot of time in, but it takes little effort and I gotten some good leads and powerful relations out of it. 👉 That’s not what this guide is about though. I also use Twitter for other stuff: leads from competitors. 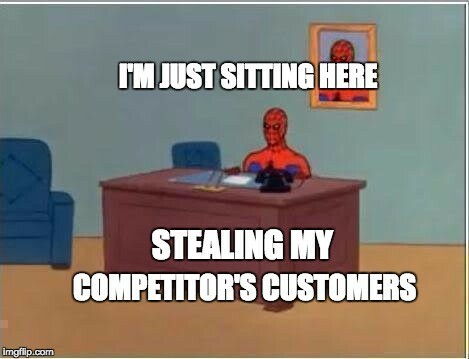 Ever since I started working as a growth marketer at Salesflare, I’ve been looking for ways to track down our competitor’s customers and target them. I didn’t hit 100% accuracy just yet — I’ll keep you in the loop — but what I’m about to tell you is still pretty cool. I’ll show you how you can directly target your competitor’s lead-worthy Twitter using Facebook, LinkedIn, email and, if you want to, Twitter itself. No I’m not drunk, I really mean Twitter Friends. You’re somebody’s Twitter friend if you follow them and they follow you back. Without this little detail, this whole tactic would be useless. If your competitor is anywhere near a serious player in the market, they’ll have a lot more followers than they follow themselves. 👉 This makes mere Twitter followers next to useless. Twitter Friends on the other hand are a lot more likely to be important to your competitor. Twitter-following is widely adopted way of building and sustaining relations with customers and influencers. Both customers and influencers great for targeting with whatever great and relevant value you have to offer them. To get a list of your competitor’s Twitter Friends, you can use FriendOrFollow. UPDATE 16/03/2018: FriendOrFollow seems to have stopped existing. RIP FriendOrFollow! We however came across the following post to do a similar thing using Followerwonk. It’s a post from 2013, but it still works at the time of writing. FriendOrFollow allows you to pull lists of Twitter following, fans (these that follow you without following them back, friends, unfollowers and followers. We’re going for Friends here. 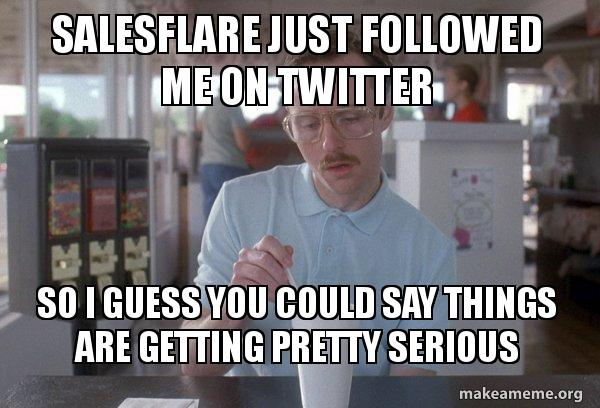 I pulled up Salesflare’s list as an example 👇. You want this stuff in a nice sheet. Hit ‘Export as CSV’ as show in the screenshot. Now, this software would have no reason to still exist if there wasn’t some kind of monetisation to it. You guessed it, .CSV export is a Pro-function. Pro is about $10 a month. No worries, you get a 7 day ‘🆓’ trial . You do have to register a credit card. Be sure to not forget to cancel your subscription if you don’t wish to pay for this. Now you have big fat .CSV with Twitter handles of your competitor’s Twitter Friends. One of the coolest things you’ll be able to do later on is making Lookalike Facebook Audiences from your competitor’s friends/customers. For this Lookalike Audience to be as accurate as possible, you’ll probably need more data than the friends from just one competitor. Just get all of them while you’re at it. For more on Facebook Audiences, Lookalike Audiences and (a lot) more, check out our Facebook Playbook. 👉 Your spreadsheet will look like the screenshot below. This one features the Twitter Friends of Pipedrive, our main competitor (Salesflare is like Pipedrive, but without all the typing). You need email addresses to make Facebook Audiences. Not just email addresses: personal email addresses. People don’t connect their work emails to Facebook. It’s unlikely you’ll find emails for all of your competitor’s Twitter handles. But we can get close, using two methods. ☝ Guessing. Making educated guesses and verifying those guesses. #1. 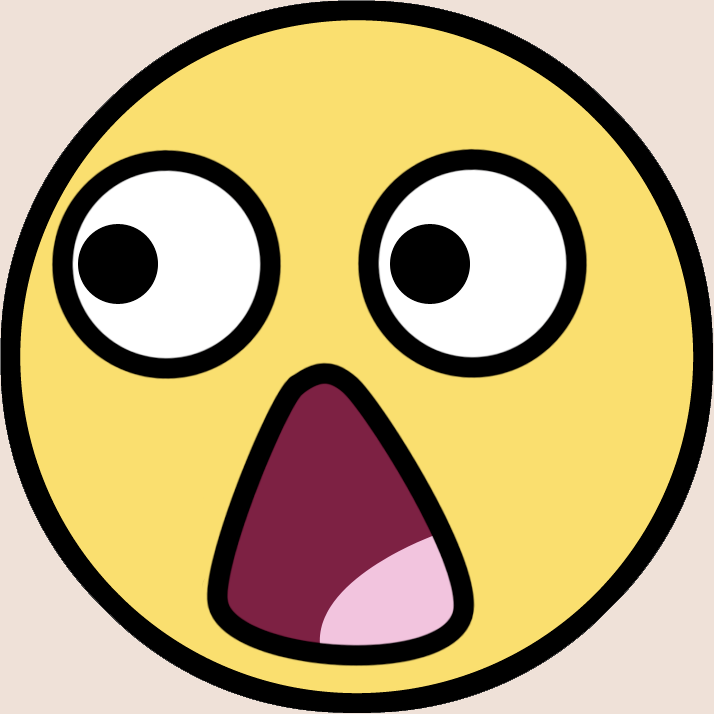 For quite some people the part that comes before ‘@’ in their personal emails is identical to their Twitter handle. #2. A lot of people also use Gmail, Outlook, iCloud (maybe even Hotmail?) for their personal emails. 👉 Open up Excel (or Google Sheets). 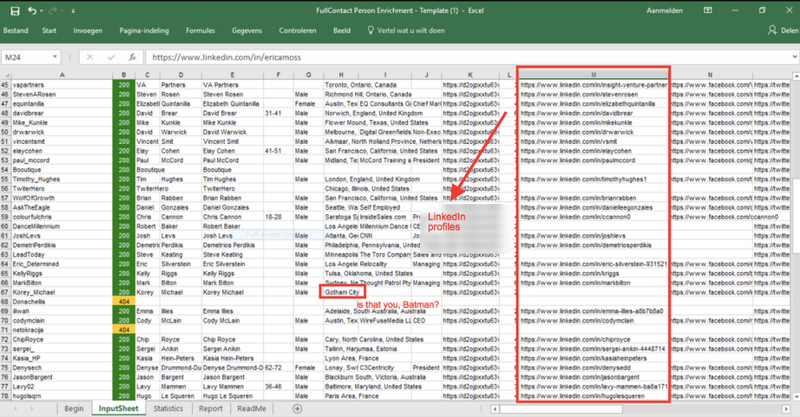 Put together email addresses [email protected], [email protected],… using ‘CONCATENATE’ in a new column in your sheet and save the column as a separate .CSV. If you’re looking to target Darth Vader and his Twitter handle is ‘darthvader’, your educated guess would be ‘[email protected]’. 👉 Now we need FindThatLead to verify if these email addresses actually exist. FindThatLead is a great tool that allows you to find anyone’s corporate email address from their first name, last name and company domain. It also has an email verifier that will tell you if an email is legit or not. 👉 We’ll just be using the email verifier function now. Make an account and select .CSV upload from your Dashboard. Then click ‘Verify Emails’. 👉 Upload your .CSV with guessed personal email addresses for verification. You can repeat this process with other common personal email domains. A free FindThatLead account will get you about 10 credits per day, so you’ll need to upgrade to a paid plan. Here’s the thing: you won’t find anything cheaper 😊. In fact, discovering FindThatLead is one of the reasons I’m writing this guide now and not before. Its fair pricing makes it worth your while. To find the email addresses you weren’t able to get with FindThatLead, we’ll first match the remaining Twitter handles with LinkedIn profiles, using FullContact. Then we’ll visit/scrape those LinkedIn profiles with Dux-Soup, asking it to retrieve the emails for us. #1. Make an account over at FullContact. #2. Download the Person Enrichment Template (Excel Macro File). #3. Log in as developer to get an API Key. #4. 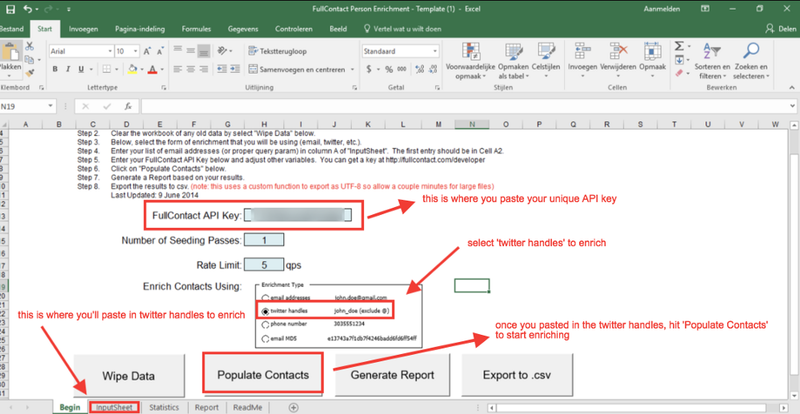 Open up the Person Enrichment Template and fill out your API key. #5. You’re ready to enrich contacts. Select Twitter handles as source. #6. Go to ‘InputSheet’ and paste the Twitter handles. #7. Go back to Begin and hit ‘Populate Contacts’. You now have all of these users’ LinkedIn profiles. At this point you’ll also have filtered out most company Twitter profiles being friends with your competitors. They won’t have Gmail emails nor LinkedIn profiles. Ah, my favourite tool: Dux-Soup 🦆. For those who’ve been missing out on one of the greatest things ever: Dux-Soup is a little robot that allows you to auto-visit LinkedIn profiles. I usually use it to auto-visit targeted profiles in LinkedIn Sales Navigator. Say from SaaS entrepreneurs located in Berlin (textbook Salesflare customers). Dux-Soup will notify these users of you visiting them. And alot of them will visit you back. You’ll be getting new connections, introductions and leads without lifting a finger. While visiting, Dux-Soup will also scrape first names, last names, industries, roles, company size and company domains and whatever else they have filled in on their LinkedIn profiles. Exportable as a .CSV — file. For more tactics to killing it on LinkedIn, check out this Playbook. ☝ We’ll be using Dux-Soup differently now. 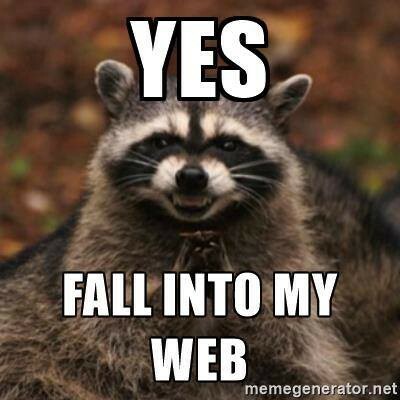 We’re going to ‘revisit’ the LinkedIn URLs you just found with FullContact and ask Dux-Soup to also retrieve email addresses for them. This is just to get the format of the .CSV right. We’ll be filling it up with the LinkedIn profiles you found for the Twitter handles with FullContact. #2. Empty the ID and visit time columns, leave the rest as it is. The other columns will still contain previously scraped data (first name, last name, company, industry etc.). It’s supposed to be like that. The functionality you’ll be using is called ‘Revisit Data’. You’re basically tricking Dux-Soup in thinking it already visited these profiles before. It will update the rest of the data once it ‘revisited’ the LinkedIn URLs in the ‘Profile column’. #6. Hit ‘Visit Profiles’ from the Dux-Soup Chrome Extension. 🔥 Now comes the other reason why I’m only writing this guide now. Before, I’d combine company domains with first names and/or last names to get the email addresses from the LinkedIn Profiles. But: these were often not personal email addresses I could use in a Facebook Audience. Things have changed since Dux-Soup launched their very own email retriever 😎. As soon as you hit that ‘Visit Profiles’ button, Dux-Soup will ask if you want them to retrieve email addresses too. You can either buy these points or trade in the email addresses from your LinkedIn connections. I found the return rate to be around 90% (!) 💥. Here’s the awesome part: a lot of the email addresses Dux-Soup will return are personal Gmail — addresses. In combination with the [email protected] trick ft. FindThatLead, you’ll now have about every personal email address there is to find for the group of competitor customers and friends. 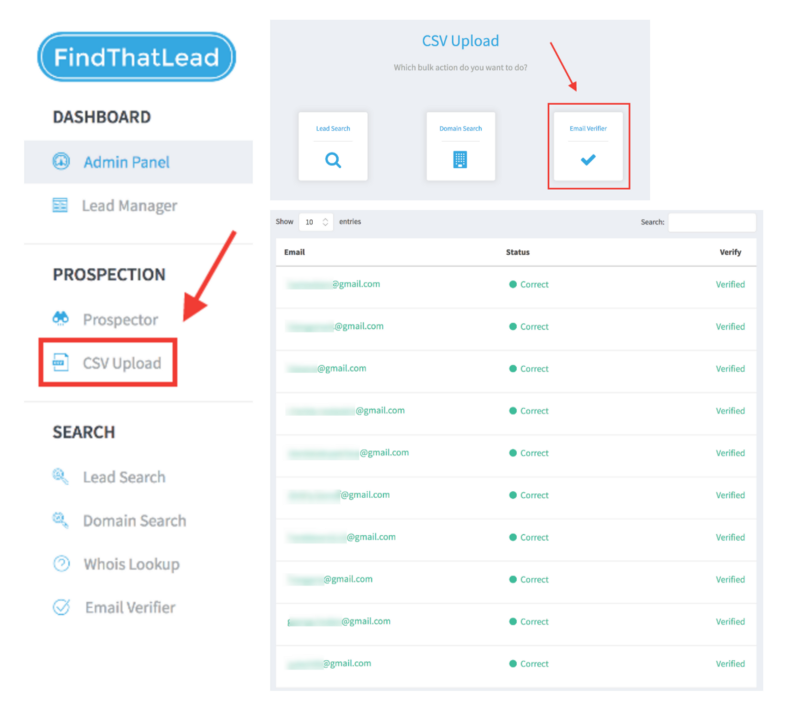 If you’re keen on finding remaining email addresses too, you can run [email protected], [email protected], [email protected] and other conventional email address formats through FindThatLead again. Why are these personal email addresses? Simple: back when LinkedIn was taking its first steps, most people signed up with their personal email and never bothered to change their primary email addresses to their work email. You might have an oh oh— moment now. Sorry about that. If you do, you can just change your primary email to your work email. Or go all the way and create a new email address specifically for people trying to send you cold emails going through LinkedIn. 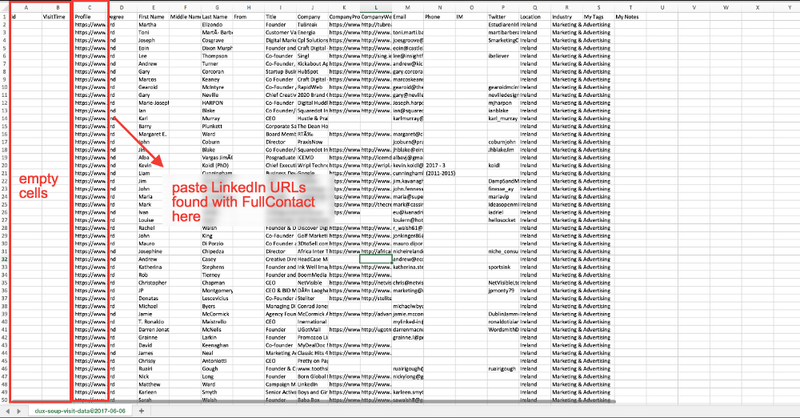 Scraping the LinkedIn URLs will get you first names, last names and company domains. You can use this to find company email addresses using the same technique as shown in Step 2. Put together email addresses like [email protected], [email protected], firstletterfirstnamelastn[email protected] etc. using CONCATENATE and run these through FindThatLead for verification. Note that these emails can’t be used for Facebook Audiences since they’re not personal emails. For cold email targeting on the other hand, this is probably better. People might not appreciate you sending cold emails to their personal inboxes. I had trouble choosing a title for this guide because there’s a lot 🤤. So, in terms of possibilities: take your pick. make Facebook Audience and target with relevant ads. 👉 Your most valued content, avoid being salesy at all cost. match email addresses with your trial database and/or email list to check who already showed interest in you. You’ll know exactly how to further nurture them as a lead. Think out of the box. There’s more where that came from 😏. For cool tricks with Facebook Audiences and Facebook Lookalike Audiences, check out the Facebook Playbook.